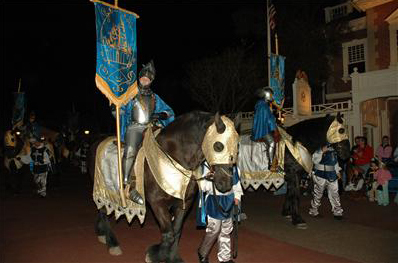 Disney’s Enchanted Adventures Parade, shown only on party nights, featured all your favorite Pirates & Princesses and began with knights on horseback (below left). 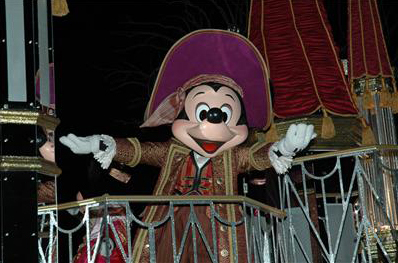 Pirate Mickey Mouse greets us from the famous mirror float (below right). 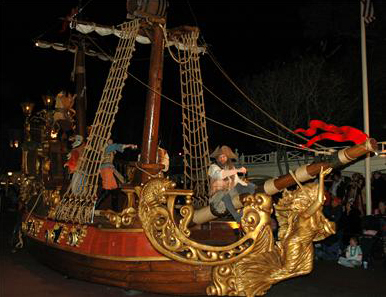 The Pirate Ship Float (below left) featured dueling pirates and cannons that shoot smoke! 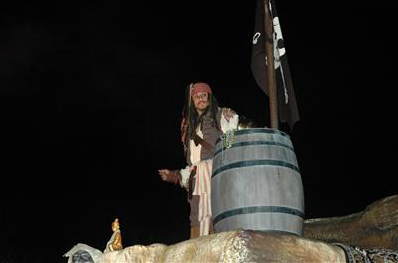 Captain Jack Sparrow looks down from the Pirates of the Caribbean float (below right). 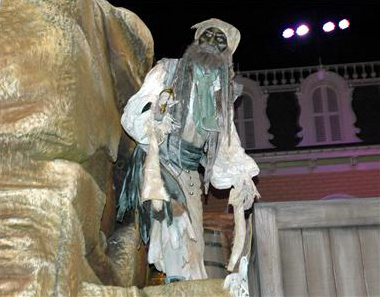 A spooky undead pirate (below left) appears with captain Jack! 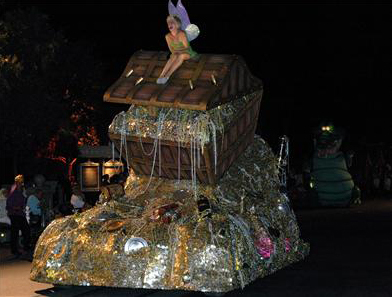 Tinkerbell made her first appearance in a Walt Disney World parade at the Pirate & Princess Party, atop this new treasure chest float (below right). 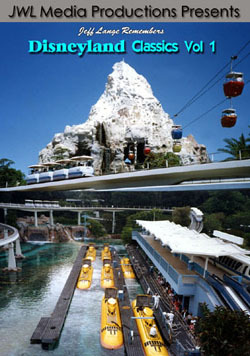 The “Tick Tock” float was added in Summer 07 (below left) Tink greets the crowd below!! 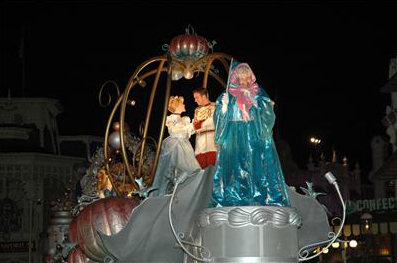 Let’s not forget the princesses as we see the Blue Fairy, Cinderella and Prince Charming (below left). 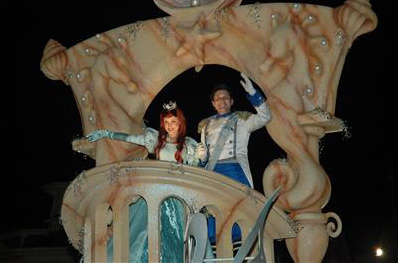 Ariel and Prince Eric wave to the crowd (below right). 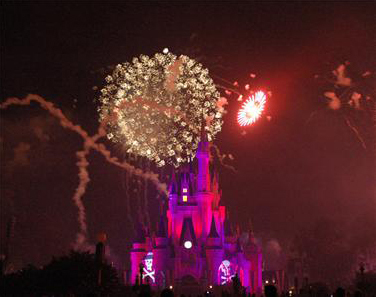 The Magic, Music & Mayhem Fireworks (above). 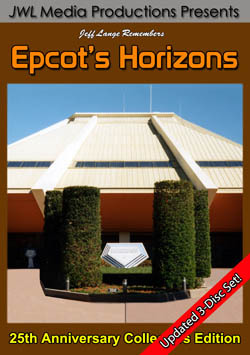 This exclusive pyrotechnic extravaganza has become the new Disney standard in nighttime entertainment! 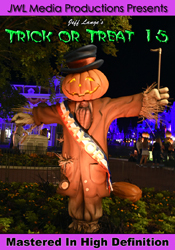 Highlights include the Sleeping Beauty fairies color fight! 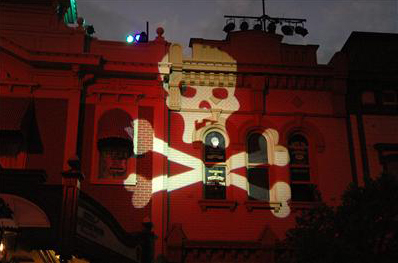 Main Street USA featured Pirate and Princess projections moving across the buildings! 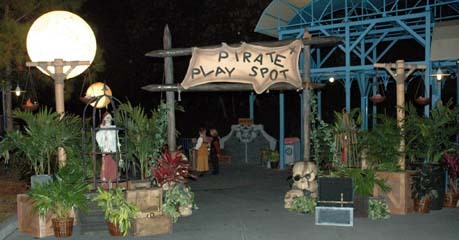 The “Pirate Play Spot” was actually very fun for adults as well as kids. 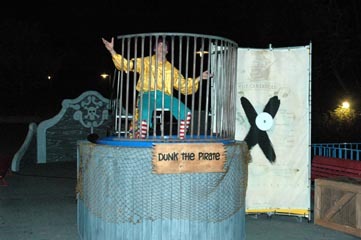 The “Dunk the Pirate” game (above). 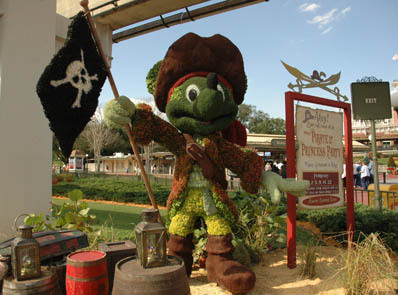 Captain Jack Sparrow’s Pirate Tutorial (Above). 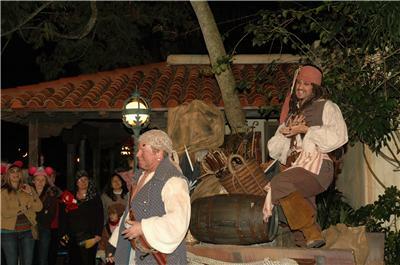 Guests learned about pursuing life in the pirate trade from Captain Jack Sparrow and his first mate Mack. 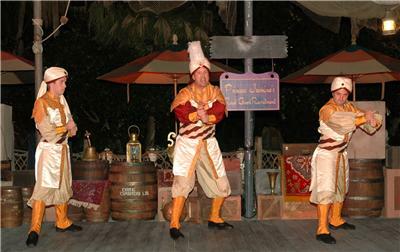 Princess Jasmine’s Royal Guard Recruitment (Above). 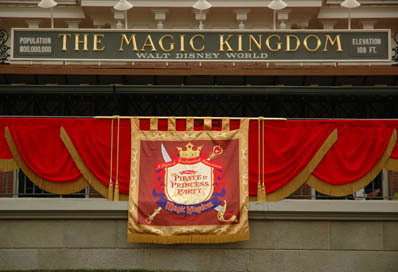 You’d master a magical invisible sword and become a member of the Royal Guard with help from Prince Aladdin. 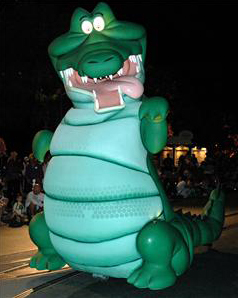 Remember to beware of the evil Jafar! 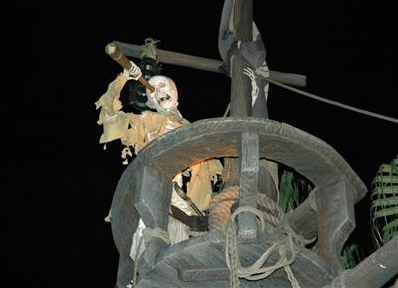 The Pirates of the Caribbean attraction was always popular on these nights! At the end of the night, you exited through the red carpets to count your booty of chocolate (replaced by coins in 2008) and beads. 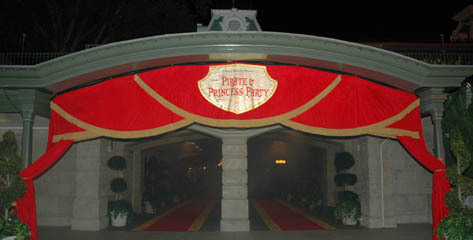 Even thought the the Pirate and Princess Parties are no longer being presented, you can still relive the magic or experience it for the first time with these great DVDs showcasing all three versions of the parties. 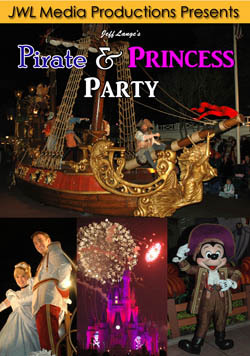 Jeff Lange returns with a new DVD featuring the original 2007 Pirate & Princess Party at Walt Disney World. 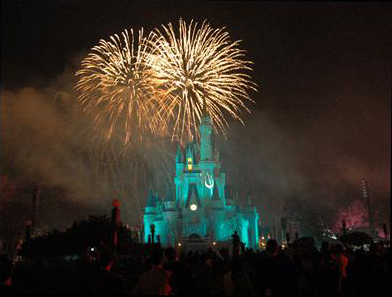 Disney’s Enchanted Adventures Parade, Magic, Music & Mayhem Fireworks Spectacular and more! 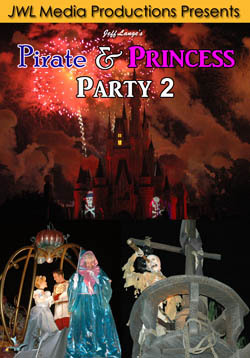 Jeff Lange returns with a second DVD featuring the summer 2007 and winter 2008 Pirate & Princess Parties at Walt Disney World . 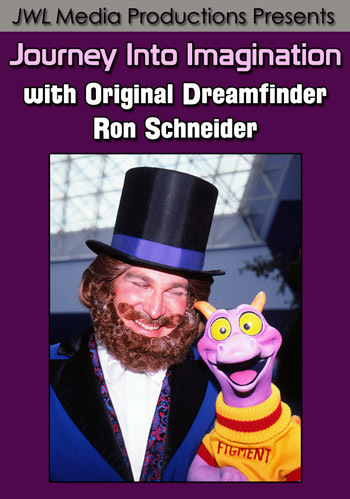 features: Dream Along With Mickey Show, Disney’s Enchanted Adventures Parade, Captain Jack Sparrow’s Pirate Tutorial, Magic, Music & Mayhem Fireworks Spectacular, Extras and more!